The WLToys V262 Cyclone quadcopter promises to be a powerful drone that is both durable and functional. Its four protective rings protect the central motor from damage, as well as each of four blades, and keep it crash-resistant. There’s the possibility to add modules and a video camera. This quad is perfect for the beginner, even an older child, but there is still plenty to interest the experienced pilot too. It’s easy to handle with its automatic controls, or switch to manual to experience fully controlled flying. There are three different color choices with the WLToys V262 quadcopter. You can choose from black with a purple and green canopy with black and red blades, or all black with two black blades and two red blades. There is also a black quad with blue and red canopy and black and red blades. The Cyclone may look large, but it’s actually quite lightweight. It’s built sturdy enough to attach a GoPro. Many other quads also can’t boast about an increase in functionality. The WLToys V262 quadcopter is ready for a variety of additions, due to its size and power. Attach one of the other WLToys modules, such as an HD, or FullHD camera, a bubble blower, water canon, basket, crane, and a missile shooter. Besides its strength, the WLToys V262 quadcopter is built with a powerful motor. Its large size holds four motors within each ring. This extra power allows it to do fun tricks too. The WLToys V262 Cyclone quadcopter is capable of some great tricks. Impress even your adult friends with its cool eversions and 360 degree flip capabilities! All it takes is a push of a button on the radio control transmitter to do these cool moves. Tricks are effortless as you impress your friends. The black framework of this quad is made from a durable plastic foam ring design. It’s built to be extremely tough, and resistant to crashes. It’s perfect for new drone pilots or for older children to learn how to fly. There will be fewer worries about damaging a new quad than if you had decided to spend $1200 on a Parrot Bebop, for example. Your worries are lessened on damaging the WLToys V262 quadcopter, and if you should crash it, it’ll just bounce back, and be ready for the next flight. While its bubble blower or missile shooter add-on capabilities may make it seem like a toy, it’s still built with a professional six axis gyroscope that allows for steady and balanced flights, even when a newbie is at the controls. Besides the many attachments you can buy, you can also get spare parts for your new. The spare parts are extensive, so you can replace a variety of items, should they become damaged, from the black plastic rings, to blades, nuts, and bolts. Each WLToys V262 quadcopter comes with a spare set of two black and two red blades. Besides the six access gyroscope, this quad has the LED running lights that you’ve come to expect from quality flying drones. 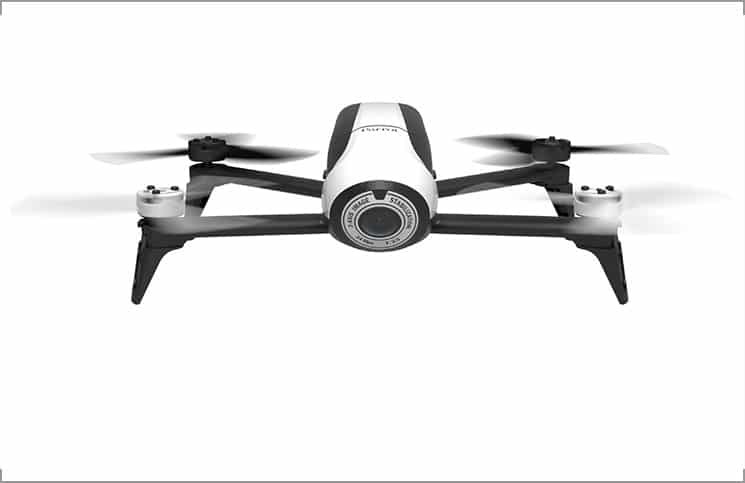 This enables you to discern the forward facing direction of the drone, preventing you from getting confused as to its orientation while in the air. The LED lights are also perfect for when you want to fly your drone at night, enabling you to keep an eye on it so you don’t lose it. They also give a fun and exciting appearance to your drone. Could it be a UFO? The V262 quad has connectivity to other drones, so you can discover infinite possibilities with your friends. Inside your box you will receive one quadcopter, a 2.4 GHz remote controller, a battery pack for the quad, four extra rotors—two red, two black, a manual and a charger. The box doesn’t include any modules or spare parts other than the 4 blades. These items you’ll need to purchase separately. There is also no memory card included, so if you buy the additional camera or GoPro kit, you’ll need to remember to buy batteries and a memory card for it. The radio transmitter also takes six batteries, which are not included in the purchase of your box kit. The WLToys V262 Cyclone Quadcopter works on 2.4 GHz technology. It has four channels, to avoid confusion in the air in case someone else brought a WLToys V262 quadcopter onto the field too. Your WLToys V262 quadcopter measures 520 millimeters by 520 millimeters and 33 millimeters tall. It weighs 219 grams. 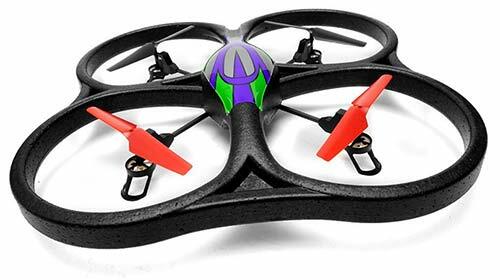 You can fly your WLToys V262 quadcopter either indoors or outdoors. You’ll be able to fly your drone out to a distance of one hundred to one hundred and fifty meters. With one full battery charge, you will have about eight to ten minutes of flying time. You’ll want to ensure that you charge up your Cyclone thoroughly, as its weight requires a full charge to get it in the air. It takes about one to one and a half hours to get your WLToys quad to charge up fully. You’ll have the capability of moving the drone with the remote controller to either up, down, left, or right positions. The WLtoys V262 is quite affordable, and priced at under $70. It’s within range of those who are curious about quads, but uncertain they want to buy a Parrot or DJI just yet. You’ll enjoy the functionality of your WLToys V262 quadcopter Cyclone. There’s enough to interest the seasoned drone pilot, as well as adult beginners, and kids too. It’s perfect for those who are curious about what a quadcopter is all about. It’s durable, and you’ll have fun adding on extra toys and gadgets. You can even get started in aerial photography by attaching your own GoPro and camera. The WLToys V262 quadcopter looks a bit different than your standard flying drone and should get plenty of attention on the flying field.